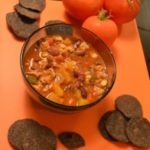 Turkey Pumpkin Chili is a great source of vitamin A, which boosts the nutrition content of this delicious meal. In a large cooking pan place a little cooking oil. when hot, sauté the onions and garlic for about 5 minutes. Add the ground turkey and let it brown for a few more minutes. Then add the peppers, tomato, pumpkin, cooked beans, tomato juice and broth. Season with salt and pepper to taste. You can add more or less liquids depending on how you like your chili. Cook in low-medium heat for about 20-25 minutes. Serve with quinoa, rice, tortilla chips or simple by itself. Enjoy!